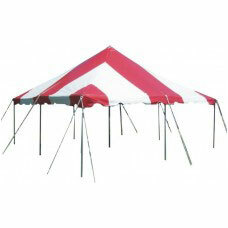 20x20 Red and White Pole Tent is great for back yard BBQ, graduation, family reunions or small parties. This beautiful tent will hold up to 6 8' banquet tables and has plenty of room to host a 40 person sit down dinner. Also this tent will be capable of holding up to 65 people for an informal event.